Responding to a question asked by David Velez, the chief executive officer of Nubank, a Brazilian fintech company backed by Thiel’s Founders Fund, during an entrepreneurship event in Sao Paulo, Brazil; billionaire venture capitalist Peter Thiel is not ready to give up on defending President Donald Trump just yet. Bloomberg reports that the PayPal and Palantir co-founder praised Trump’s honesty, adding that unlike other Republican presidential hopefuls from the 2016 election, he isn’t a "zombie" and was the only candidate who addressed what Thiel considers politics’ biggest problem: political correctness. "I got to meet a lot of people running for president on the U.S. Republican side in 2016 and they all felt like zombies," he said during a Monday event on entrepreneurship in Sao Paulo, Brazil. "They couldn’t say anything different other than programmed ideological soundbites." Trump, Thiel said, is "a very healthy corrective to that." "with all the flaws, all the challenges the Trump administration’s had, I believe it was incredibly important to articulate certain things about how our political institutions and our society were not working as well as before." In February, Thiel decided to abandon Silicon Valley, relocating his home and personal investment firms to Los Angeles, because tech culture has become increasingly intolerant of conservative political views since Mr. Trump’s election, an attitude he has said is intellectually and politically fraught. 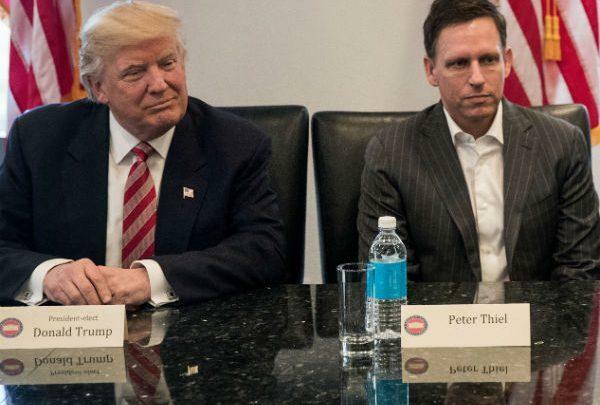 During an event hosted by the Economic Club of New York in March, Thiel said he had last spoken to the president "a few months ago." Fox News host Maria Bartiromo also asked him if he thinks Trump will get a second term in office. "I think that if he runs again, he will get re-elected," Thiel said. "He'll make a judgment. And if he thinks he can get re-elected, he will run. And if he runs, I think he will win."